As a result of the steroid chemotherapy that Ryan has been on for his Lymphoma treatment, he has developed Adrenal Insufficiency. This is hopefully a temporary condition that will improve once chemotherapy treatment has finished, however, only time will tell. There are two types of Adrenal Insufficiency. Primary and Secondary. Ryan’s type is secondary and can be traced to a lack of ACTH, a hormone which causes a drop in the adrenal glands production of cortisol but not aldosterone. This form of secondary adrenal insufficiency has occurred after receiving a glucocorticoid hormone, in Ryan's case, Dexamethasone steroid as part of his Cancer treatment. Cortisol is normally produced by the adrenal glands, which are located just above the kidneys. Cortisol has many functions, but its most important job is to help the body respond to stress. The high dosage use of Dexamethasone to treat Ryan's lymphoma has caused a hormonal imbalance which hopefully will rectify itself as Ryan’s body begins the healing process once treatment finishes. Some sources advise that the body needs approximately one month of healing for every month of treatment it received for cancer. Ryan had two months of Radiotherapy and 6 months of Chemotherapy so we are looking at 8-12 months of post-treatment healing, but the doctors have already forewarned us that Ryan faces 2-3 years of maintenance ahead. The symptoms of adrenal insufficiency usually begin gradually. Chronic, worsening fatigue and muscle weakness, loss of appetite, and weight loss are characteristic of the disease. Nausea, vomiting, and diarrhoea occur in about 50 percent of cases. However many if not all of these are also common in Cancer and we had put Ryan's symptoms down to chemotherapy side effects. A random blood monitoring test done in the hospital because Ryan was vomiting despite anti-sickness medication showed severe Hypoglycemia, (or low blood sugar) which warranted further tests that discovered the adrenal diagnosis. Because the symptoms progress slowly, they are usually ignored until a stressful event like an illness or an accident causes them to become worse. 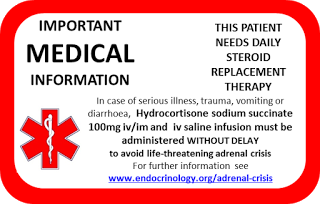 This is called an adrenal crisis, or acute adrenal insufficiency. In most patients, symptoms are severe enough to seek medical treatment before a crisis occurs. However, in about 25 percent of patients, symptoms first appear during an adrenal crisis which is what happened in Ryan’s case. Symptoms of an adrenal crisis include sudden penetrating pain in the lower back, abdomen, or legs; severe vomiting and diarrhoea, followed by dehydration; low blood pressure; and loss of consciousness. Left untreated, an adrenal crisis can be fatal. Ryan was diagnosed by an ACTH Stimulation Test. In this test, blood and/or urine cortisol levels are measured before and after a synthetic form of ACTH is given by injection. In the so-called short, or rapid, ACTH test, cortisol measurement in blood is repeated 30 to 60 minutes after an intravenous ACTH injection. The normal response after an injection of ACTH is a rise in blood and urine cortisol levels. Patients with either form of adrenal insufficiency respond poorly or do not respond at all. In Ryan’s case, he responded poorly. Ryan is being treated now with hydrocortisone tablets three times a day and we have been trained in using an injection crisis kit in the case of any future adrenal crisis. He has to carry a steroid alert card at all times and during any time of illness or infection, he is required to double his normal daily dose of tablets called a stress dose, for the duration of the illness or infection. We, fortunately, have not yet had to use the crisis injection, but we have been required to up his dose during a recent 10-day hospital stay between chemotherapy cycles, for a staphylococcus infection. I can never thank the doctor at the Teenage Cancer Trust Unit in Cardiff Hospital for trusting her gut that day and requesting a random blood monitoring test be done. Up until this point, I had assumed his constant vomiting was down to the effects of chemo, but the doctor disagreed as he was on 2 different types of anti-sickness medication. She had a hunch. She saved Ryan’s life. Emotionally moving stuff - particularly the last sentence. She did. I hugged her and made her cry, when I thanked her. Mr Darwish the surgeon that saved Ryan's life even more urgently that night his stomach ruptured, will forever be my hero. He gave Ryan just 48 hours. Scary stuff. I am so pity on Ryan.. very informative post.